Laboratory tests conducted on water samples in the reference lab in Amman, Jordan on the cause of death of freshwater fish in the Euphrates River in Iraq have revealed the contamination of water with high content of coliforms, heavy metals, and high concentration of ammonia. Health experts from the World Health Organization (WHO) and the Ministry of Health and Environment in Iraq say that while these materials are toxic to fish, they pose no health threat to humans. Testing on dead fish has revealed serious issues that warranted WHO to conduct a second investigation related to probable viral infection of fish causing the death of thousands in the river. Results of the second test are due next week. The laboratory investigations came in response to a request to WHO by the Iraqi Ministry of Health and Environment to assess the likely effects of the fish death on humans and the environment. As early as 2 November this year, thousands of tonnes of fish have died in the Euphrates River causing significant loss to fish farms and production in the southern part of Iraq especially in Babel province, 85 kilometers south of Baghdad. WHO continues to work with its MOH counterparts to develop appropriate preventive measures to effectively mitigate and respond to future incidents of this nature. Posted in Agriculture, baghdad, Euphrates, featured, fish farming, pollution, water, water pollution, World Health Organization (WHO). The AMAR International Charitable Foundation has begun construction of a domestic-wastewater-purification system in the Mesopotamian Marshes, where all 30 houses in the village of Al Adhaima will be connected to the network. The project, which is being funded as part of The Coca-Cola Company’s global “Replenish” water initiative, will employ traditional methods, largely using the area’s natural reed beds as a filtration system for the village’s wastewater. The urgent need for the scheme has only been increased by a summer of drought, which has hit water levels and quality badly. The Mesopotamian Marshes, thought by many to be the location for the Garden of Eden, are a rare wetland at the confluence of the Tigris and Euphrates Rivers. As well as being a unique ecosystem, the area is home to around 300,000 Marsh Arabs, whose own rich culture centres on the Marshes’ natural resources. Sadly, the area has a long and troubled history of drainage, drought and displacement. In the 1990s Saddam Hussein drained around 90% of the Marshes in an effort to crush the Marsh Arabs. Hundreds of thousands were displaced. After his fall from power in 2003, the waterways were reopened and the Marshes replenished, and the locals began to return. But the recovery has been only partial. This year reduced river flows, compounded by drought, have led to a drying-up of parts of the Marshes, as well as increased water salinity. Pollution is also a growing problem as population and industry grow but aging infrastructure struggles and decays. The agriculture and livestock that underpin local livelihoods are under severe threat. Many farmers in the marshes keep water buffalo, but high water salinity is depleting herds. AMAR’s Replenish Project is seeking to tackle some of these issues in the Hammar Marshes. It will use the existing natural reedbed systems for the final process in the collection and treatment of domestic sewage and wastewater. Once treated, aerated and filtered, the cleaned water will be redirected to the river, where it will flow into and recharge the Marshes. The project is being carefully monitored and evaluated in close co-ordination with the Directorate of the Environment, who has been part of the project team throughout. AMAR has long been an advocate for the survival of the Marshes and its people. In 2016 it successfully campaigned for the area’s recognition as a UNESCO World Heritage Site, affording it an increased level of protection. In 2012 AMAR ran a Heritage Project in the marshes, funded by the US State Department, which included the publication of a book documenting the history and culture of the region, The Southern Mesopotamian Marshlands: Reclaiming the Heritage of a Civilisation. The Replenish Project seeks to continue this work. It will improve the water quality of the targeted area of the Hammar Marshes and preserve the unique marshland environment. This, in turn, will support the Marsh Arabs in re-establishing their ability to manage the marshes, and sustain livelihoods there, which has been so disrupted by historical persecution. The reintroduction of managed reedbeds, which can also be used for farming and harvesting, also provides the local community with raw materials for traditional crafts and construction techniques. As such, this project has the potential to position the local community as a cultural hub and centre for access to the Marshes. 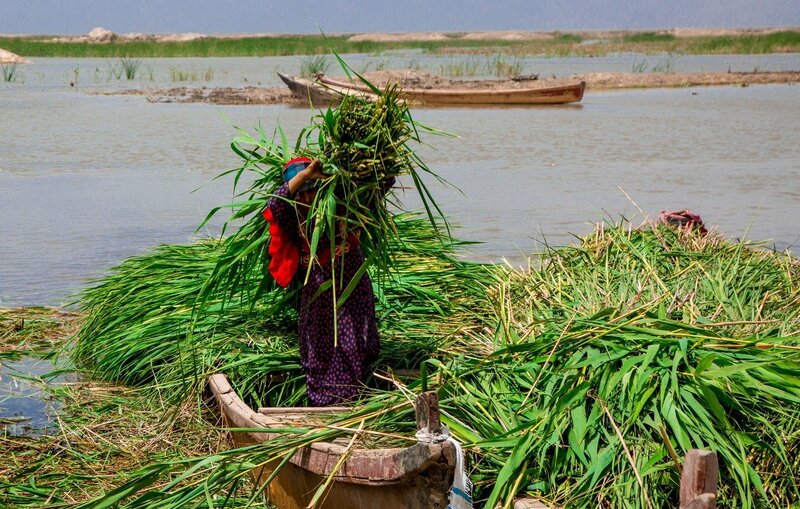 A woman collects reeds for the construction of a mudhif, a traditional reed house. AMAR will be working closely with The Coca-Cola Foundation throughout the project. Once the pilot scheme is complete, with further funding and support from the Iraqi Ministry of Environment and local Directorates, it hopes to roll out the project as a sustainable model in other marshland communities. Posted in Agriculture, AMAR Foundation, AMAR International Charitable Foundation, Business, Coca Cola, Euphrates, featured, Iraqi Marshes, Tigris. Tamimi said the lake’s falling levels are related to the drought that has plagued Iraq since 2017; some estimate the drought will continue until 2026. But there are no plans to restore the lake, said Tamimi, a deputy from Ammar Hakim’s Hikmat movement. He said a number of civil society activists and specialists on natural resources in Karbala province have criticized the “government’s idleness over the water crisis in Lake Milh,” with some activists working together on a media campaign to draw the world’s attention to the lake. Thyab’s remarks indicate that it would be next to impossible to restore Lake Milh as a tourist attraction whose beautiful flora and fauna once brought foreign and Iraqi tourists from every province. Karbala has also suffered greatly from the armed conflicts in the last decade, most recently when armed groups who fought against the Iraqi state used it as a base. The city of Karbala’s practice of draining polluted water into the lake has also contributed to the problem. But there is hope for the lake yet. In January, the Iraqi National Investment Commission (NIC) unveiled a $25 million investment project to rehabilitate and develop both Lake Milh and al-Habbaniya, a lake linked to Milh by the narrow Sin-Al-Thibban Canal. Lakes such as Milh represent essential natural reservoirs in efforts to fight the drought that haunts Iraq’s agriculture sector. Cooperation with neighboring countries to restore and protect them will be crucial to the region’s survival. Posted in Agriculture, baghdad, Basra, Business, Commission, Committee, Dams, Dinar, Dinar Daddy, Dinar Guru, Dinar Recaps, Dinar Vets, Euphrates, featured, Iraq Industry & Trade News, Karbala, Lake Milh, Lake Razzaza, Leisure and Tourism in Iraq, National Investment Commission (NIC), Turkey, water, water management. Posted in Agriculture, baghdad, Business, Dam, Dams, Euphrates, featured, Iran, Iraq Public Works News, Leisure and Tourism in Iraq, Politics, Syria, Tigris, Turkey, water, water management. By Hassan al-Shanoun for Al-Monitor. Any opinions expressed are those of the author, and do not necessarily reflect the views of Iraq Business News. Although the Iraqi parliament voted to put an end to encroachments against the marshes May 14, many fear the possibility of Iraq’s losing its position on the World Heritage List and being denied the international recognition that would have been of great benefit for the country, especially since previously agreed-upon service and construction programs were not established. First off, there are concerns about the Water Resources Ministry’s continuing to build settlement islands in the Chibayish marshes, south of Dhi Qar, which UNESCO considers to be a clear violation of the conditions the marshes need to meet in order to stay on the World Heritage List. Posted in Business, Committee, erbil, Euphrates, featured, Iraq Public Works News, Iraqi Marshes, Tigris, UNESCO, World Heritage List. The Minister of Water Resources, Dr.Hassan Janabi, has met with the Romanian Ambassador in Baghdad, Mr. Lacop Prada and the Economic Officer of the Embassy. During the meeting, they discussed cooperation in the area of irrigation, and the possible contribution of Romanian companies in dredging the Tigris and Euphrates rivers and preparing them for navigation. Posted in baghdad, Construction & Engineering In Iraq, dredging, Euphrates, featured, Iraq Public Works News, Romania, Tigris. By Sara al-Qaher for Al-Monitor. Any opinions expressed are those of the author, and do not necessarily reflect the views of Iraq Business News. In conjunction with the military maneuvers of the Iranian-backed Shiite Popular Mobilization Units along the Iraqi border with Saudi Arabia on Jan. 4, former Iraqi Prime Minister Nouri al-Maliki attacked Saudi Arabia from Tehran on Jan. 3, accusing Riyadh of being a source of terrorism and of backing terror groups in the region. This followed another maneuver by Iranian-Iraqi maritime forces at the Shatt al-Arab, a waterway formed by the confluence of the Tigris and Euphrates rivers that flows into the Persian Gulf. Maliki’s statements and the military maneuver both carry a clear message to Saudi Arabia that Iraq is a full ally of Iran against any Saudi threat. On Dec. 16, Iranian naval forces conducted a military exercise with a nominal participation of the Iraqi naval forces at the Shatt al-Arab. Iranian naval commanders said the military drills were aimed at enhancing joint maritime patrols, searching suspected boats and preventing smuggling, infiltration and piracy in the waters of the Shatt al-Arab. The Iraqi naval forces participated in the exercise with six Defender boats. This joint exercise is the first between Tehran and Baghdad since the restoration of bilateral relations after 2003. Jabbar al-Saidi, the head of the security committee in the Basra provincial council, described the drills as mere joint tactical exercises to enhance Iraq’s maritime capabilities and expertise. He told Al-Monitor that the exercise had opened the door to joint cooperation between Iraqi and Iranian coastal guards focused on controlling activities of smugglers and traffickers. He said that the drills will continue in light of the ongoing cooperation and meetings with Iran to promote joint naval security work. The Shatt al-Arab is seen as the backbone of the Iraqi economy, serving as a channel for ships heading to the port of Basra from the Persian Gulf. It is also a major source of irrigation for palm groves. The Shatt al-Arab is 190 kilometers (118 miles) long and 2 kilometers (1.2 miles) wide in some areas. Iran has three ports along the Shatt al-Arab: the ports of Khorramshahr, which has seen significant expansion, Abadan and Khosro-Abad. In recent years, Iran has also started building three more ports, in addition to new offshore platforms. Posted in baghdad, Basra, Business, Committee, Euphrates, featured, Iran, Iraqi Navy, Saudi Arabia, Security, Shatt al-Arab, Tigris. In collaboration with the Government of Iraq (GoI), the United Nations Development Programme (UNDP) organized a 3-day workshop on enhancing international cooperation on sustainable management of Euphrates and Tigris Rivers. Held over the period of 13 to 15 November at Al Nahrain Centre for Strategic Studies in Baghdad, the workshop was attended by 31 senior Iraqi officials from the Prime Minister’s Advisory Council, Council of Minsters’ Secretariat, Council of Representatives, National Security Advisory as well as the Ministries of Foreign Affairs, Water Resources, Agriculture, and Health and Environment. Amongst the workshop presentations were the GoI’s on the status of the water resources in Iraq, in addition to UNDP’s on the best international practices and principles in cooperation on international water resources. Posted in baghdad, Construction & Engineering In Iraq, Euphrates, Iraq Public Works News, Tigris, water management.